As the post-crisis regulatory reforms initiated by the Basel Committee on Banking Supervision (BCBS) are approaching the final phase of implementation, the focus of the Committee is shifting to ensuring effective supervision by further improving supervisory tools and techniques. Imminent transition to Indian accounting standards (Ind AS) will be challenging for Indian banks in terms of skills as well as the requirement of higher amount of provisioning. In the meanwhile, the Reserve Bank of India (RBI) tightened its disclosure and standard assets provisioning requirements, while adopting a more pro-active approach in resolution of stressed assets. It reinforced its supervisory and enforcement frameworks by revising the prompt corrective action (PCA) framework and establishing an Enforcement Department. Securities and Exchange Board of India (SEBI), along with the RBI, allowed derivative transactions in the International Financial Services Centers (IFSCs), while making the disclosure requirements for top listed entities more comprehensive. Investor protection measures were further strengthened by SEBI. Pension Fund Regulatory and Development Authority (PFRDA) permitted one more record keeping agency which has brought down charges and is likely to enhance returns to the investors in the long run. Global insurance sector continues to operate in a challenging macroeconomic environment as per the report of International Association of Insurance Supervisors (IAIS). Concerns arising from frauds and cyber-attacks remain elevated with the recent global ransomware attacks. Various responses by the regulators in this regard include setting up of an Inter-disciplinary Standing Committee on Cyber Security by the RBI. 3.1 While transposition of the relevant post-crisis Basel standards to the domestic regulations seems to be largely complete as per the ‘Twelfth progress report on adoption of the Basel regulatory framework1’, the full and consistent implementation across jurisdictions still calls for significant efforts as reflected in the regulatory consistency assessment programme (RCAP) reports. Furthermore, as reflected in its 2017-18 work programme themes2, the focus of the BCBS is shifting from issuing Standards (regulations) to ensuring effective supervision by further improving supervisory tools and techniques, developing case studies and identifying best practices, where appropriate, in a number of key areas. 3.2 The major global regulatory developments since the last Financial Stability Report (FSR) have been in the areas of non-performing advances (NPAs) and forbearance, disclosure requirements and accounting provisions. In April 2017, Basel Committee on Banking Supervision (BCBS)’s guidance on ‘Prudential treatment of problem assets – definitions of non-performing exposures and forbearance’, harmonised the measurement and application of non-performing exposures and forbearance, and complemented the existing accounting and regulatory framework for asset categorisation. While being very relevant to the Indian banking scenario, the guidelines rightly advocate to view ‘forbearance’ in two perspectives, viz., good and bad. While “good forbearance” facilitates bona fide borrowers facing temporary financial difficulties to carry on their business and overcome the temporary difficulties and enables banks to protect the economic value of their loan assets, “bad forbearance” results in funding the unviable accounts of borrowers as well as continuously evergreening the unviable stressed assets in the books of the lenders. While any regulatory measure extending forbearance to assist the stressed borrowers and banks can be misused by unscrupulous elements (Type II error), keeping the regulations inflexible and rigid can cause severe hardship to bona fide borrowers as well as banks (Type I error). For the regulator, the dilemma lies in choosing between the Type I and Type II errors of forbearance and more importantly, in the modification of banks’ behaviour that any type of forbearance regime entails. 3.3 Besides the above guidance, the BCBS issued two important standards in March 2017. The first one, i.e., ‘Pillar 3 disclosure requirements – consolidated and enhanced framework’, inter-alia, consolidates all existing BCBS disclosure requirements into Pillar 3 framework and introduces a “dashboard” of a bank’s key prudential metrics which will provide users of Pillar 3 data with an overview of its prudential position. The other standard, viz., “Regulatory treatment of accounting provisions – interim approach and transitional arrangements” was issued in response to the forthcoming international accounting standards on expected credit loss provisioning (IFRS 9). It has been proposed that in view of the limited time until the effective date of International Financial Reporting Standards (IFRS 9), the Committee will retain the current regulatory treatment of provisions under the Basel framework for an interim period. The plausible impact of Indian accounting standards (Ind AS) in this context is broadly captured in Box 3.1. A. Estimated increase in stock of provisions on transition to Ind AS – A significant increase in the stock of provisions on loans is expected at the date of transition to Ind AS, both from Stage 13 and Stage 24 loans, although the increase as on the date of transition is permitted to be directly set off against reserves/retained earnings as a transitional adjustment. Stage 1 provisions under the Ind AS is expected to be generally higher vis-à-vis the current standard advances provision at 0.40 per cent for majority of the advances. On the other hand, a portion of the current portfolio of standard advances is expected to move to Stage 2 which will require higher levels of provisions based on lifetime expected loss provisions. Under Ind AS, as portfolios deteriorate, (although not defaulted) and therefore move to Stage 2, there may be a likelihood of cliff effect due to significant increase in ECL. (i) Financial liabilities – Under Ind AS 109, the measurement basis of financial liabilities is similar to the current practices followed by banks, i.e., financial liabilities are likely to be measured at amortised cost. (ii) Loans and advances – The measurement basis for loans and advances in general, is the same and, in most cases, amortised cost will be the most relevant category for loans and advances under Ind AS. A very small proportion of loans contracted under the “hold to sell/securitise” business model are expected to be fair valued under Ind AS. (iii) Investment portfolio – Fair value, in particular FVOCI5 is likely to be the most relevant category for a major portion of the investments of Indian banks, which are currently held under the Held to Maturity (HTM) category. It needs to be noted that, the current practice of sale6 and transfers from HTM category, would be inconsistent with the Ind AS framework where sales out of amortised category, if not insignificant, would fail the business model test for classification as amortised cost7. (iv) The regulatory requirement under liquidity coverage ratio (LCR) that a portion of high quality liquid assets (HQLAs) portfolio be periodically monetised, could perhaps also preclude some securities from being classified under amortised cost. C. Impact on equity and regulatory capital on transition – The total estimated impact of Ind AS on equity/regulatory capital is likely to be adverse, mainly driven by the impairment requirements, although the downside impact is expected to be partially offset by creation of deferred tax assets. The shift in classification of investments to fair value and the subsequent marked-to-market (MTM) gains/ losses will also have an impact on the opening equity. Going forward, public sector banks (PSBs) with pension liabilities could also report better profits as the actuarial losses, which under the current accounting standards are charged off to profit & loss account, shall be taken to OCI under Ind AS. This will improve the profit numbers but will be equity/CRAR neutral. D. Transitional arrangements for the impact of ECL accounting on regulatory capital – In view of the expected reduction in regulatory capital ratios as banks make a transition to ECL accounting, RBI believes that it may be appropriate to introduce transitional arrangements for the impact of accounting changes on regulatory capital. The primary objective of a transitional arrangement is to avoid a “capital shock”, by giving banks time to rebuild their capital resources following a potentially significant negative impact arising from the introduction of ECL accounting. As per the BCBS document, there are a number of high-level requirements for jurisdictions choosing to adopt a transitional arrangement, relating to the capital metric (CET 18) to which it should be referenced; whether the transitional adjustment should be calculated just once, at the point of transition, or recalculated in the light, for example, of changes in the stock of provisions post-transition (i.e., a “static” vs “dynamic” approach); the period to be allowed for transition; the amortisation of the transitional adjustment on a straight line basis; no neutralisation of capital impact; consequential adjustments elsewhere in the prudential framework; and transparency and disclosure. 3.4 As explained in Box 3.1, the analysis of proforma financial statements submitted by the banks revealed wide variations in underlying assumptions leading to divergence in provisioning requirements. Based on end-September 2016 reporting, the additional provisioning requirements as on April 1, 2016 under Ind AS of private sector banks on transition date as a percentage of net worth were substantially lower than that for public sector banks. Comparison of additional provisions under Ind AS, which can be taken as a measure of additional economic losses not captured in the current provisioning regime, with market-based measure of erosion viz. the erosion embedded in price to book ratio of 13 listed public sector banks (PSBs) (whose proforma Ind AS submissions have been examined) reveal that the accounting provisions engendered by Ind AS are generally higher with reported median Ind AS erosion of about 40 per cent as against median price to book of these entities showing an erosion of 23 per cent, the difference possibly reflecting the value of growth option, embedded in the valuation of banking stocks but not reflected in the accounting provisions. Nevertheless, non-standard assumptions across banks run the risk of assets with similar impairment characteristics treated differently, making it imperative to put in place some basic standardisation of treatment. 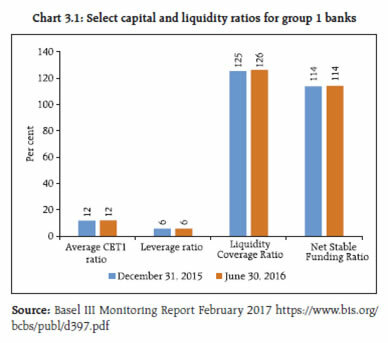 3.5 Meanwhile, as reflected in Basel III monitoring results9 published by the Basel Committee, virtually all participating 210 banks10 meet Basel III minimum and target CET1 capital requirements as agreed up to end-2015 (Chart 3.1). These results, apparently, imply that financial system risks have been greatly reduced. However, a test of this proposition for major institutions in the United States and around the world11 based on certain parameters throw contradictory results. The test indicates that financial market information provides little support to the view that major institutions are significantly safer than they were before the crisis. The above findings may be useful in the Indian context where Indian Economy is struggling with the ‘twin balance sheet problem’ and banks take refuge under forbearance instead of alternatives that bring them market access. 3.6 Back home, the Government further empowered the Reserve Bank to proactively address the stressed assets problem through an ordinance in May 2017. Accordingly, the Banking Regulation Act was amended by inserting two sections which authorise the Reserve Bank to issue directions to banks to (i) initiate insolvency resolution process in respect of a default under the provisions of Insolvency and Bankruptcy Code, 2016 (IBC), (ii) to resolve stressed assets and (iii) specify authorities/ committees to advise banks on resolution of stressed assets. Further, banks were advised that non-adherence to instructions and timelines specified under the JLF Framework12 shall attract monetary penalties under the provisions of the Banking Regulation Act, 1949, and, various regulatory resolution frameworks issued from time to time would form part of the corrective action plan (CAP). Additionally, the threshold regarding binding decisions was reduced by specifying that agreement between a minimum of 60 per cent of creditors by value and 50 per cent of creditors by number in the JLF would be considered as the basis for deciding the CAP, and will be binding on all lenders. 3.7 Furthermore, the Reserve Bank constituted an Internal Advisory Committee (IAC), comprised majorly of its independent Board Members, to advise it in this matter. The IAC, in its first meeting, took up for consideration the accounts which were classified partly or wholly as non-performing from amongst the top 500 exposures in the banking system and arrived at an objective, non-discretionary criterion for referring accounts for resolution under IBC. In particular, the IAC recommended for IBC reference all accounts with fund and non-fund based outstanding amount greater than ₹5000 crore, with 60% or more classified as non-performing by banks as of March 31, 2016. The IAC noted that under the recommended criterion, 12 accounts totalling about 25 per cent of the current gross NPAs of the banking system would qualify for immediate reference under IBC. As regards the other non-performing accounts which do not qualify under the above criteria, the IAC recommended that banks should finalise a resolution plan within six months. In cases where a viable resolution plan is not agreed upon within six months, banks should be required to file for insolvency proceedings under the IBC. 3.8 In order to ensure greater transparency and promote better discipline with respect to compliance with income recognition, asset classification and provisioning (IRACP) norms, banks were advised in April 2017 to make suitable disclosures in their Notes to Accounts, wherever either (i) the additional provisioning requirements assessed by the Reserve Bank exceeded 15 per cent of the published net profits after tax for the reference period or (ii) the additional Gross NPAs identified by the Reserve Bank exceeded 15 per cent of the published incremental Gross NPAs for the reference period, or both. As seen from the current annual reports of banks and market reaction to the divergence, this is proving to be a landmark regulation towards reducing the information asymmetry of regulated entities. Further, as a pre-emptive measure, banks were advised to make provisions at higher rates in respect of advances to stressed sectors of the economy, specifically mentioning the telecom sector. The other important regulations issued to banks are given in Table 3.1. 3.9 As part of the efforts towards addressing risks that could emanate from the so-called global shadow banking system, the International Organisation of Securities Commissions (IOSCO) published its ‘Findings of the Survey on Loan Funds13’ in February 2017. Loan funds represent a unique type of fund within the area of fund innovation in a small niche-market. It is generally perceived as an alternative to traditional financing-channels due to retreat of banks from certain segments of the market on account of stricter capital requirements. Consequently, they may give rise to potential risks such as liquidity risks, credit risks, investor protection and systemic risks, which may require regulatory attention. Presently, India only allows Funds to invest in transferable securities. 3.10 Carrying forward the G-20 agenda to reform over-the-counter (OTC) derivatives markets, in February 2017, the Committee on Payments and Market Infrastructures (CPMI) and the IOSCO jointly issued a technical guidance on Harmonisation of the Unique Transaction Identifier (UTI)14. This is intended to guide authorities on the definition, format and usage of the UTI that meets the needs of UTI users, and is global in scale and jurisdiction-agnostic. UTI will facilitate aggregation of the OTC data reported across trade repositories (TRs) for a comprehensive view of OTC derivatives markets and activity. 3.11 In addition, there have been positive developments regarding liquidity of secondary corporate bond markets and implementation of IOSCO’s principles for financial benchmarks. In its final report on ‘Examination of Liquidity of the Secondary Corporate Bond Markets15’, IOSCO did not find substantial evidence showing liquidity has deteriorated markedly from historic norms for non-crisis periods and there was no reliable evidence that regulatory reforms have caused a substantial decline in the liquidity of the market. In its second review16 of implementation of principles for financial benchmarks in respect of the WM/Reuters 4 p.m. Closing Spot Rate, it was found that most of the IOSCO recommendations have been fully or mostly adopted and the implementation of the Principles has been significantly advanced since the first review. 3.12 In India, with a view to integrating the reporting and disclosure of listed entities with the guiding principles of International Integrated Reporting Council (IIRC) and IOSCO Principle 16, Securities and Exchange Board of India (SEBI) has advised that integrated reporting may be adopted on a voluntary basis from the financial year 2017-18 by top 500 listed companies which are required to prepare business responsibility report (BRR). Further, in order to provide an impetus to the municipal bond market in India, SEBI has rationalised the requirement of submission of audited/unaudited accounts for the immediately preceding financial year by the municipalities/municipal corporations for the private placement of debt securities, thereby obviating a practical difficulty faced by issuers. In addition, it issued detailed criteria for eligibility, retention and re-introduction of derivative contracts on commodities to be followed by all national commodity derivatives exchanges. 3.13 In order to attract long term funds in revenue generating infrastructure projects having sustainable cash flows, SEBI amended regulations on Infrastructure Investment Trusts (InvITs) allowing a two-level (Holdco) structure, relaxation in minimum sponsor holding and rationalising other operational issues. Following this, IPO of two InvITs have been successfully launched and listed on Stock Exchanges. Other important regulatory steps taken by SEBI are given in Table 3.1. 3.14 Globally, insurance industry is facing new challenges as well as opportunities (Box 3.2). In February 2017, the International Association of Insurance Supervisors (IAIS) published its 2016 Global Insurance Market Report (GIMAR)17. As the current environment is challenging the conventional business models, the report, inter-alia, advises the insurers to avoid the “Winner’s Curse” of under-pricing in order to win business. The introduction of IFRS 17, due to be implemented by 2021 will also bring in much needed standardisation in valuation of insurance across insurers. The changing profile of the financial sector post-global financial crisis has posed some challenges while presenting new opportunities to the insurance industry. Similar to the churning that has been happening in every subset of the financial sector, the way business of insurance will be done in future will be different, asking for new set of regulatory responses. InsurTech, again a subset of FinTech is at the forefront of driving this transformation. If buying an insurance is cumbersome, insurers are already experimenting with big data to see if the latter can replace the plethora of questions that a customer has to answer. On the other hand, there is a view that this might help insurers better price differentiated premiums for the same risk category. Technology also may prompt insurers to go for more efficient strategies such as dynamic reset of premiums or upfront alerts ahead of a person approaching an established risk event. Bots18 are increasingly thought of as a reliable companion in the industry and may replace brokers and sales personnel. Healthcare insurers with the help of tracking devices are encouraging their customers to exercise more if they want to reduce the premiums. And there is a talk that the separation between various types of insurance may also go with big data helping insurers to come out with a single comprehensive insurance that covers an individual’s overall risk – life and nonlife. There is also a different thinking that is doing rounds in the non-insurance industry which may be a challenge to the insurance industry to deal with. That is the concept of “self-insurance” which in other words mean that instead of one going to an insurer one is ready to bear the losses – something that some players in the car industry are mulling with to replace the conventional product liability insurance. While most of the things that discussed earlier may take time to fructify, cyber insurance seems to have come of age. However, unlike other branches of insurance, cyber insurance policies lack standardisation. As on 2015, cyber coverage was predominantly being written on a claims-made basis for protection against data loss and primarily covered third-party liability in the United States. However, policies are increasingly getting tailored toward protection against financial losses incurred from data breach as also against the more ambiguous “business interruption”. Nevertheless, there are inadequate disclosures about cyber-crimes impeding data collection since companies are usually reticent to publicise themselves as victims of cyber-attack. As regards the prospects of cyber insurance, even before the recent ransomware WannaCry attack, cyber-attacks had been on the rise as had been the economic costs associated with cyber-attacks. The Llyod’s 2015 insurance report estimates global economic costs attributable to cyber-attacks at USD 400 billion per year, even without reckoning costs associated with reputation damage. With increasing usage, the coverage for cyber insurance is likely to increase with premium income projected to increase to USD 10 billion by 2020. Yet the biggest offshoot of the growth in cyber insurance will possibly be in behaviour modification of companies – well-trained employees, realistic risk assessment of cyber vulnerabilities and preventive actions like investment in preventive software and hopefully, more upfront admissions of occasional data breaches. 3.15 Back home, Insurance Regulatory and Development Authority of India (IRDAI) is considering the introduction of ‘Title Insurance’ product in the Indian market. In addition, the IRDAI has revised the ‘Trade Credit’ guidelines to extend credit insurance coverage to micro, small and medium enterprises (MSME) sector. Further, during 2016-17, Pradhan Mantri Fasal Bima Yojana (PMFBY) was introduced and seventeen insurance companies were empaneled for implementation of PMFBY scheme. The sudden spurt in the growth of crop insurance premium during 2016-17 warrants the need for adequate reinsurance capacity. On the Reinsurance front, the recent amendment to the Insurance Act 1938 has permitted the entry of branches of foreign reinsurers into the country. Lloyd’s too has set up a branch in India. Further a private Indian reinsurance company has recently been registered. All these are changing the hue of reinsurance landscape in India. 3.16 A joint report19 by the PFRDA and CRISIL states that by 2050, every fifth Indian will be a sexagenarian compared with every twelfth now, putting the country in a position similar to today’s developed world in terms of the share of the elderly in population. It emphasises the urgency for development of the underpenetrated pension market in India. This becomes more important when informal family support, forming part of the non-financial “fourth pillar20” identified by the World Bank to benchmark pension system in a country, is reducing in India. Therefore, the focus needs to be on both expanding coverage, spreading awareness and improving the adequacy of returns of different pension schemes. Ensuring consistency across pension products in terms of accounting valuation, taxation and disclosures could also aid growth of the industry. 3.17 National Pension System (NPS) now provides the seamless facility to the subscribers of superannuation scheme and provident fund to shift to NPS without any tax implication with the implementation of one time portability proposed under the union budget 2016-17. The growth in coverage under the NPS has continued to gain traction in terms of number of subscribers as well as assets under management (AUM) (Chart 3.2). 3.18 The PFRDA has decided to allow one more entity to start its operations for servicing of accounts sourced through e-NPS module of NPS Trust. With this step, subscribers will now have the option of choosing between two central record-keeping agencies (CRAs), i.e., NSDL e-governance Ltd (1st CRA) and M/s Karvy Computershare Pvt. Ltd (2nd CRA) with effect from February 15, 2017 and other distribution channels thereafter. Increased competition from the 2nd CRA for pension funds is likely to bring down charges and enhance returns to the investors in the long run. Other important regulatory measures taken by PFRDA are given in Table 3.1. 3.19 Some of the recent regulatory initiatives, including prudential and consumer protection measures with the rationale thereof are given in Table 3.1. February 01, 2017 The Reserve Bank advised through a press release that it has not given any license / authorisation to any entity / company to deal with Bitcoin or any virtual currency or to operate such schemes. As such, any user, holder, investor, trader, etc. dealing with virtual currencies (VCs) will be doing so at their own risk. This was with a view to clarify the ambiguities arising from virtual currency related activities in India. Previously in December 2013, the RBI had cautioned the users, holders and traders of VCs including Bitcoins about the potential financial, operational, legal, customer protection and security related risks that they were exposing themselves to. February 02, 2017 NRIs were allowed access to the exchange traded currency derivatives market to hedge the currency risk arising out of their investments in India under FEMA, 1999. Currently NRIs are permitted to hedge their INR currency risk through OTC transactions with authorised dealer (AD) banks. With a view to enable additional hedging products for NRIs to hedge their investments in India, the circular allows them access to the exchange traded currency derivatives market to hedge the currency risk arising out of their investments in India under FEMA, 1999. Consequently, NRIs may take positions in the currency futures / exchange traded options market to hedge the currency risk on the market value of their permissible Rupee investments in debt and equity and dividend due and balances held in NRE accounts. (ii) Reserves representing appropriation of net profits, including statutory reserves, and excluding share premium, revaluation reserve, foreign currency translation reserve, investment reserve and reserves created on amalgamation. While the Basel III rules text allows payment of coupon on AT 1 instruments from ‘distributable profits’, it does not define the term per-se. RBI has adopted a flexible approach while expanding the scope of the term ‘distributable profits’ at the time of declining profits of banks. This allows banks to make coupon payments on their perpetual debt instruments (PDI) under Additional Tier 1 capital even from the permissible statutory reserves, if sufficient balance is not available under the revenue or other reserves. February 08, 2017 It was decided to establish a separate Enforcement Department for developing a sound framework and process for enforcement action. Regulation, surveillance and enforcement are three important facets of financial sector oversight mechanism. While there is a clear demarcation of the regulatory and surveillance functions in the Reserve Bank, a need was felt to develop a sound framework and process for enforcement action. Accordingly, a separate Enforcement Department was established which started functioning from April 1, 2017. February 28, 2017 An Inter-disciplinary Standing Committee on Cyber Security was set up to, inter alia, review the threats inherent in the existing/emerging technology; study adoption of various security standards/protocols; interface with stakeholders; and suggest appropriate policy interventions to strengthen cyber security and resilience. While (in line with the June 2016 RBI instructions on cyber-security) banks have taken several steps to strengthen their defences, the diverse and ingenious nature of cyber-attacks necessitated an ongoing review of the cyber security landscape and emerging threats. Therefore, the need for an inter-disciplinary standing committee on cyber security was felt and the sixth bi-monthly Monetary Policy Statement, 2016-17 proposed the constitution of the same. April 10, 2017 Extant guidelines on permissible activities of the International Financial Services Centres (IFSC) Banking Units (IBUs) were amended to allow IBUs (i) to undertake derivative transactions including structured products, (ii) to become a trading member of an exchange in the IFSC for trading in interest rate and currency derivatives segments, (iii) to become a professional clearing member (PCM) of the exchange in the IFSC for clearing and settlements in any derivatives segments, and (iv) to maintain Special Non-Resident Rupee Account(s) (SNRRA) with a bank (AD) in the domestic sector for meeting its administrative expenses in INR, subject to regulatory conditions. The Reserve Bank had issued regulations in March 2015 relating to financial institutions set up in International Financial Services Centres (IFSC). These regulations are amended from time to time to accommodate the evolving needs of the banking sector as well as to reflect the experience gained. April 12, 2017 It was decided to allow substitution of collateral (security) by the market participants during the tenor of the term repos conducted by the Reserve Bank under the Liquidity Adjustment Facility (LAF). The securities offered for substitution by the market participants shall be of similar market value based on the latest prices published by the Fixed Income Money Market and Derivatives Association of India (FIMMDA). This was allowed in order to facilitate market participants facing genuine technical problem and willing for security substitution. April 18, 2017 Banks were allowed to participate in Real Estate Investment Trusts (REITs) and Infrastructure Investment Trusts (InvITs) within the overall ceiling of 20 per cent of their net worth permitted for direct investments in shares, convertible bonds/ debentures, units of equity-oriented mutual funds and exposures to Venture Capital Funds (VCFs) [both registered and unregistered], subject to certain conditions. The Securities and Exchange Board of India (SEBI) has put in place regulations for REITs and InvITs and requested the Reserve Bank to allow banks to participate in these schemes. Currently, banks are allowed to invest in equity-linked mutual funds, venture capital funds (VCFs) and equities to the extent of 20 per cent of their net owned fund (NOF). Therefore, it was decided to allow banks to invest in REITs and InvITs within this umbrella limit. April 18, 2017 Banks were advised to put in place a Board–approved policy for making provisions for standard assets at rates higher than the regulatory minimum, based on evaluation of risk and stress in various sectors. The policy shall require a review, at least on a quarterly basis, of the performance of various sectors of the economy to which the bank has an exposure to evaluate the present and emerging risks and stress therein. RBI has prescribed various rates of provision for standard advances. However, these rates are minimum and building up of stress in specific sectors of economy may need higher than the minimum provision as a preemptive measure to address the potential stressed assets from those sectors. Accordingly, this circular has specifically mentioned the telecom sector which may need higher provision. 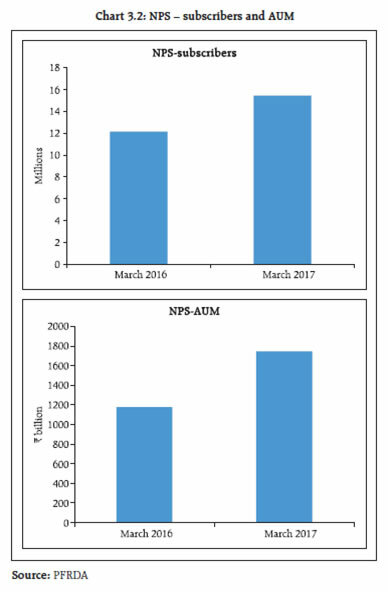 April 18, 2017 Banks were advised to make suitable disclosures wherever either (a) the additional provisioning requirements assessed by RBI exceed 15 per cent of the published net profits after tax for the reference period or (b) the additional Gross NPAs identified by RBI exceed 15 per cent of the published incremental Gross NPAs for the reference period, or both. The Reserve Bank assesses compliance by banks with extant prudential norms on income recognition, asset classification and provisioning (IRACP) as part of its supervisory processes. There have been instances of material divergences in banks’ asset classification and provisioning from the RBI norms, thereby leading to the published financial statements not depicting a true and fair view of the financial position of the bank. In view of this, banks were advised to make these additional disclosures. April 18, 2017 Banks were advised not to recognise in the profit and loss account the proportionate exchange gains or losses held in the foreign currency translation reserve on repatriation of profits from overseas operations. Repatriation of accumulated profits shall not be considered as disposal or partial disposal of interest in non-integral foreign operations as per AS 11 The Effects of Changes in Foreign Exchange Rates. It was observed that banks were recognising gains in profit & loss account from Foreign Currency Translation Reserve (FCTR) on repatriation of accumulated profits / retained earnings from overseas branch(es) by treating the same as partial disposal under AS 11. The matter was examined taking into consideration, inter alia, the views of the Institute of chartered accountants of India (ICAI), and it emerged that the repatriation of accumulated profits shall not be considered as disposal or partial disposal of interest in non-integral foreign operations as per AS 11. April 27, 2017 Banks were advised to lay down a Board-approved policy clearly defining the role and responsibilities of the Chief Risk Officer (CRO). The policy shall include the necessary safeguards to ensure the independence of the CRO. As part of effective risk management, banks are required, inter-alia, to have a system of separation of credit risk management function from the credit sanction process. However, it was observed that the banks followed diverse practices in this regard. The guidelines were issued to bring uniformity in approach followed by banks, as also, to align the risk management system with the best practices. April 28, 2017 Guidelines on Merchant Acquisition for Card Transactions for co-operative banks were issued, which allowed all co-operative banks not intending to act as Point of Sale (POS) acquiring bank to deploy third party POS terminals without prior approval of RBI, and, co-operative banks intending to act as POS acquiring bank to deploy their own POS terminals with prior approval of RBI, subject to fulfilling certain criteria. Under the extant guidelines, co-operative banks have been permitted to install both onsite/offsite ATM networks and to issue debit cards on their own or through sponsor banks based on certain eligibility conditions. They are also allowed to enter into credit card business on their own or co-branding arrangement with other banks. These guidelines were issued keeping in view the need for encouraging digital channels for financial transactions in co-operative banks. April 28, 2017 All registered Asset Reconstruction Companies (ARCs) were advised that their minimum NOF requirement was fixed at ₹1 billion on an ongoing basis with effect from April 28, 2017. The notification was issued keeping in view the amendment in the SARFAESI Act, 2002, with a greater role envisaged for ARCs in resolving stressed assets as also the recent regulatory changes governing sale of stressed assets by banks to ARCs. June 7, 2017 For the new sanctions, RBI prescribed a uniform risk weight of 35 per cent for the individual housing loans ‘above ₹30 lakh and upto ₹75 lakh’ with loan-to-value (LTV) ratio of upto 80 per cent. Similarly, the risk weight for such loans ‘above ₹75 lakh’ was brought down to 50 per cent from 75 per cent. Simultaneously, standard asset provisioning for all categories of individual housing loans was reduced to 0.25 per cent from 0.40 per cent from this date. The changes have been made in the guidelines as a countercyclical measure and with a view to supporting growth in credit to the individual housing loans segment. June 7, 2017 The Statutory Liquidity Ratio (SLR) of commercial banks, primary (urban) co-operative banks (UCBs), state co-operative banks and central co-operative banks was reduced from 20.5 per cent of their Net Demand and Time Liabilities (NDTL) to 20.00 per cent from the fortnight commencing June 24, 2017. RBI has been gradually reducing the SLR with a view to facilitate scheduled commercial banks (SCBs) to maintain the minimum required liquidity coverage ratio (LCR) which was phased in at 60 per cent from January 1, 2015 to reach 100 per cent on January 1, 2019 with annual increase of 10 per cent. June 7, 2017 It was decided that any proposal of borrowing by eligible Indian entities by issuance of Rupee denominated bonds overseas (Masala Bonds) will be examined by the RBI. Further, the provisions in respect of maturity period, all-in-cost ceiling and recognised lenders (investors) of Masala Bonds were also revised. The changes were done with a view to harmonise the various elements of the external commercial borrowing (ECB) framework. January 5, 2017 Issuance of Guidance Note on Board Evaluation. To educate the listed entities and their Board of Directors about various aspects involved in the Board Evaluation process and improve their overall performance as well as corporate governance standards to benefit all stakeholders. This would serve as a guide for listed entities and may be adopted by them as considered appropriate. Anything mentioned in the Guidance Note shall not be construed as interpretation of provisions of SEBI (Listing Obligations and Disclosure Requirements) Regulations, 2015 (“SEBI LODR”) or any other law. January 20, 2017 Fair and transparent access to data feeds of the stock exchanges. For fair and transparent dissemination of information, SEBI has advised stock exchanges to formulate a comprehensive policy document for providing stock market related data to the market participants, irrespective of the type of mechanism used by the stock exchanges for broadcasting of data. January 27, 2017 Prescribing Procedures for Exchange Listing Control Mechanism. To address any conflict arising out of the provisions of listing of a stock exchange on any recognised stock exchange, other than itself, and also to ensure effective compliance with the applicable laws, the procedures for Exchange Listing Control Mechanism was prescribed by SEBI. February 10, 2017 Review of Financial close out and Auction framework for corporate bonds traded on the Stock exchanges platform – Stock exchanges were advised to conduct financial close-out in case of shortage of delivery. The financial close out shall take place at highest price on Trade date (which becomes the trade price) with a 1% mark-up on trade price. Further, Exchanges / Clearing Corporation shall introduce an uniform auction mechanism to deal with settlement shortages by March 31, 2017. Working Group on Development of Corporate Bond Market in India had recommended rationalisation of penalty for financial close out in case of the shortage of delivery in the corporate bonds that are traded in the exchange platform. Based on the recommendation of the said committee and the feedback received from stock exchanges, SEBI has reviewed extant penalty structure for financial closeout in cases of short delivery and to put in place a feasible auction mechanism to deal with settlement shortages. February 20, 2017 Participation in derivatives market by Mutual Funds – SEBI has permitted the introduction of derivative investments in an existing scheme, whose Scheme Information Documents (SIDs) do not currently envisage such investments, without the requirement of obtaining positive consent from majority of unit holders. However, prior to the scheme commencing participation in derivatives, all investors of such schemes shall be given exit option with no exit load for 30 days, as against exit option to only dissenting unit holders mandated earlier. To facilitate ease of doing business in view of the challenges involved in seeking the consent of majority of the unit holders, and in view of prudent investment norms that are in place for investment in derivatives by Mutual Funds. February 22, 2017 The additional exposure limits of debt schemes of mutual funds towards Housing Finance Companies (HFCs), over and above the prudential limits towards financial services sector was increased from 10% to 15% of the net assets of the scheme. This was considering the role of HFCs especially in affordable housing and to further the Government’s goal under Pradhan Mantri Aawas Yojana (PMAY). February 23, 2017 Amendment pursuant to comprehensive review of Investor Grievance Redressal Mechanism To enhance the effectiveness of grievance redressal mechanism at Market Infrastructure Institutions (MIIs), SEBI has comprehensively reviewed the existing framework in consultation with the Stock Exchanges and Depositories (inter alia, issues relating to strengthening of arbitration mechanism and investor protection mechanism). February 28, 2017 Permitting investments by Foreign Portfolio Investors (FPIs) in corporate debt securities To enhance the investor base in unlisted debt securities and securitised debt instruments. March 15, 2017 Review of advertisement guidelines for Mutual Funds To disclose Mutual Fund scheme’s performance related information in a more effective and simple manner for the use of investors. March 16, 2017 Disclosures relating to regulatory orders and arbitration matters on websites of Clearing Corporations To improve transparency in disclosing the regulatory orders and arbitration awards issued by clearing corporations, all regulatory orders i.e. orders against clearing members and arbitration / appellate awards by arbitrators need to be made available to investors. April 03, 2017 Capacity Planning Framework for the Depositories In line with the capacity planning framework of Stock Exchanges and Clearing Corporations, certain technical and general requirements were put in place for Depositories (Depositories being identified as financial Market Infrastructure Institutions which facilitate and perform systemically critical functions in the securities market) while planning capacities for their operations. April 13, 2017 Inclusion of “Derivatives on Equity shares” – IFSC Securities and Exchange Board of India (International Financial Services Centres) Guidelines, 2015 specifies the types of securities in which dealing may be permitted by stock exchanges operating in IFSC. Based on the recommendations of the Risk Management Review Committee of SEBI, “Derivatives on equity shares of a company incorporated in India” has been specified as permissible security, to deal in, under sub-clause (vi) of Clause 7 of SEBI (IFSC) Guidelines, 2015. April 18, 2017 Review of the framework of position limits for Interest Rate Futures contracts To ease trading requirements in the Interest Rate Futures contracts, the position limit linked to open interest shall be applicable at the time of opening a position. Such positions shall not be required to be unwound immediately by the market participants in the event of a drop of total open interest in Interest Rate Futures contracts within the respective maturity bucket. January 10, 2017 The Authority has broadened the coverage of AYUSH in health insurance under IRDAI (Health Insurance) Regulations 2016 by allowing to cover treatment undergone in recognised teaching hospitals of AYUSH colleges and AYUSH Hospitals having registration with a Government authority, in addition to the presently permitted government hospitals or institutes recognised by government. This will broaden the alternatives available to insured persons. (i) The subscribers/corporates will have the choice for change of the option (active or auto choice) as well as asset allocation ratio (allocation among asset class-equity/corporate bonds/ government securities/alternate investment) two times in a financial year. This scheme preference is applicable to the existing pension corpus as well as to the prospective subscriptions. The option is available separately for Tier I and Tier II accounts. (ii) The choice of Pension Fund shall remain once in a financial year. The changes are effective from April 1, 2017. March 6, 2017 Transfer of amount from recognised Provident Fund/ Superannuation fund to NPS With a view to facilitate transfer from recognised provident funds to the National Pension System (NPS), clause (iv) in Rule 8 of Part A of the Fourth Schedule to the Income Tax Act has been inserted through the Finance Act 2016 so as to provide exemption from taxation to one time portability from a recognised provident fund to the NPS. Further, a sub clause (v) to section 10(13) of Income Tax act has been inserted to provide for the exemption from tax to any payment from an approved superannuation fund by the way of transfer to the account of the employee under NPS referred to in section 80CCD and notified by the Central Government. With the introduction of this provision in the said clause, transfer of funds of an assesse employee from his existing superannuation fund to a pension account under NPS, is not liable to be treated as income of such assesse for the said Assessment Year. 3.20 The Financial Stability and Development Council (FSDC) held its sixteenth meeting on January 05, 2017 under the Chairmanship of Finance Minister, since the publication of the last FSR in December 2016, wherein the state of the economy, pre-budget 2017-18 consultations with the financial sector regulators, issues related to non-performing assets of Indian banking system, FinTech, digital innovations and cyber security & emergent issue of debit card data theft, financial inclusion and financial literacy were discussed. 3.21 The FSDC sub-committee held a meeting chaired by Governor on April 17, 2017. The Sub-Committee reviewed the major developments on the global and domestic fronts that impinge on the financial stability of the country. Status of implementation of recommendations of FSB Peer Review of India and the progress of Financial Sector Assessment Program21 (FSAP) 2017 were discussed in the meeting. Issues such as setting up of Computer Emergency Response Team for the Financial Sector (CERT-Fin), roadmap for National Centre for Financial Education (NCFE) and macroprudential framework in India were also discussed. Further, the Sub- Committee reviewed the activities of its various Technical Groups and the progress achieved on the decisions/ recommendations emanating from its earlier meetings. 3.22 As envisaged under various regulatory initiatives, new players like differentiated banks are offering niche products to specific strata of consumers. Moreover, financial disintermediation is getting broadened with growth in market-based financing of real sector. These developments, although envisaged under regulatory frameworks, will have inevitable side-effects like increased competition and downward pressure on traditional earning modes of commercial banks. The need of the hour is to take this as opportunity for their business models. 3.23 The June-2016 FSR had discussed the theme of bank-dominated and market-based financial systems. The pickup in capital market has, to some extent, offset the fall in credit growth. Total fund raising from capital market through issuance of various instruments viz. 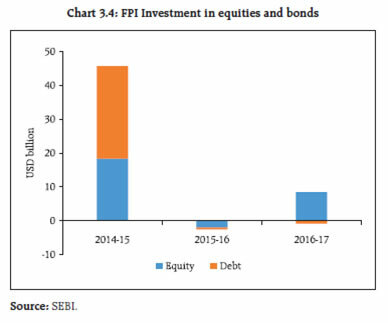 equity (public issues, rights issues, qualified institutional placements (QIPs) and preferential allotments) and debt (public issue and private placements), has continued to increase during last four financial years (Chart 3.3). 3.24 Various initiatives taken by SEBI and RBI to develop the market for corporate bonds over the last few years seem to be bearing fruit now. 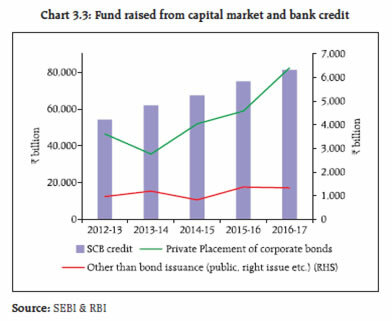 While the corporate bond primary issuances have increased from ₹1.74 trillion in 2008-09 to ₹6.7 trillion in 2016-17, the secondary market activities, both in terms of number of trades and volumes are also on the rise, with 2016-17 witnessing growth of 26 per cent in terms of number of trades and 44 per cent in terms of volume as compared to previous year (Table 3.2). 3.25 During 2016-17, Foreign Portfolio Investors (FPIs) invested US $ 7.6 billion in Indian equities and bonds, as against a net divestment of nearly US $ 2.5 billion (Chart 3.4) in the preceding financial year, whereas the investments by Mutual Funds (MFs) in Indian equities and bonds were significantly positive in both the years, contributing nearly ₹4.42 trillion and ₹3.76 trillion respectively. 3.26 A day-wise analysis of last one year reveals that nearly 59 per cent of the time, net investments by mutual funds in equities and market return of Indian benchmark index Nifty moved in the same directions, whereas the same was true for about 54 per cent of the time with regard to net foreign investments (Chart 3.5). In the debt market, 49 per cent of the time FPI net investments were able to influence the market return. However, the same was 57 per cent vis-à-vis net investments by mutual funds. This in effect implies that, in recent time, domestic investments by mutual funds in equities and debt have started to play an increasingly important and stabilising role, to complement FPIs in shaping the overall movements in the market. This trend is conducive to the overall stability of Indian securities market. 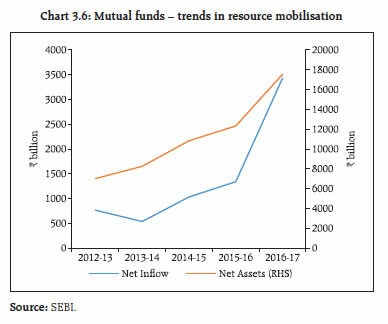 3.27 The resource mobilisation and redemption by mutual funds peaked in March 2017 (Chart 3.6). The gross inflows into equity oriented and balanced mutual funds remained significantly positive, while gross inflows and redemption moved in tandem in the case of debt oriented fund. Further, asset under management (AUM) of B-1523 cities has expanded by 230 per cent24 during the four year period from 2012-13 to 2016-17 and the growth trends is in tandem with the overall growth of MF industry AUM (Chart 3.7). 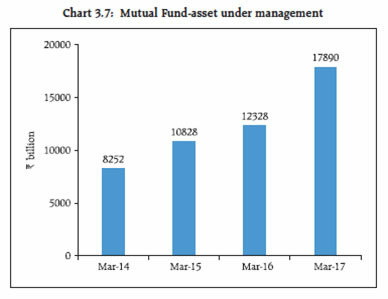 3.28 There has been encouraging trend in investment flows to Mutual Funds (MFs) in last three years. During 2016-17, net investment flow to mutual funds was more than ₹3.4 trillion, as a result of which the MF Asset under Management (AUM) touched an all-time high of more than ₹17.5 trillion by March 31, 2017. Further, the industry is witnessing consistent positive net inflows of investments into equity oriented MFs in each of the last three financial years. 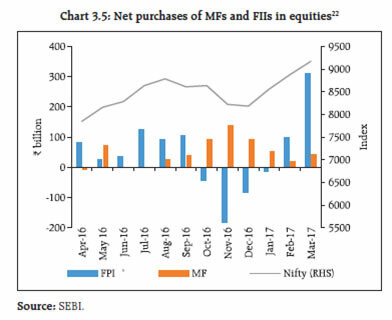 During last three financial years net inflows into the equity oriented MFs were to the tune of more than ₹2.15 trillion. The increased inflow of investments in mutual funds and their investment in equities and bonds, in particular are providing a much needed stability to the market movements, hitherto influenced to a significant extent by FPI. 3.29 Indian commodity derivatives markets witnessed mixed trends during the year with metals gaining in volume and value while agriculture, bullion and energy segments shrank. While the benchmark indices moved up (MCX COMDEX by 18.7 per cent and NCDEX Dhaanya by 7.8 per cent) during the financial year 2016-17, the aggregate turnover at all the exchanges in the domestic commodity derivative segment dropped by 2.9 per cent. 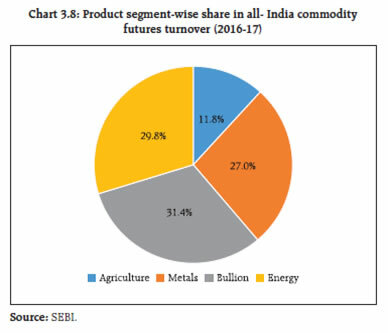 Indian commodity derivatives markets (Chart 3.8) continue to be dominated by non-agri products which account for around 88 per cent of the total annual turnover, comprising of bullion (31.4 per cent), energy (29.7 per cent) and metal (27.0 per cent). In the meanwhile, the two prominent national commodity exchanges – NCDEX and MCX, deemed to be systemically important Financial Market Infrastructure (FMIs), are in the process of complying with the Principles for FMIs (PFMIs) specified by CPSS-IOSCO25. 3.30 Options contracts in commodity derivatives recently permitted by SEBI will further enhance the price discovery process while the integration of the broking activities in equity and commodity derivatives market under a single entity would expand the reach of intermediaries to retail participants in derivatives market and economise on the requirement of regulatory capital. SEBI is also examining institutional participation in the commodity derivatives market. During 2016, six new commodities (diamond, tea, eggs, cocoa, pig iron and brass) have been added to the list of commodities derivatives contracts. The Indian Commodity Exchange (ICEX) is set to launch the diamond contracts. This will earn India, the distinction of being the first country in the world where polished diamonds would be traded. 3.31 While India has the potential to replicate its success of equity derivatives in commodity derivatives and emerge as a major futures trading hub, the fragmented physical/spot market remains the main challenge. With a view to reforming the commodities markets, the Union Budget 2017-18 had announced the constitution of an expert committee to study and promote creation of an operational and legal framework to integrate spot market and derivatives market for commodities trading. 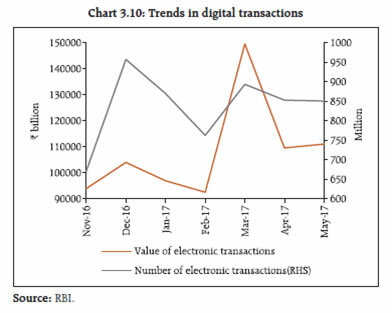 3.32 In the wake of demonetisation, digital transactions have got a substantial push. 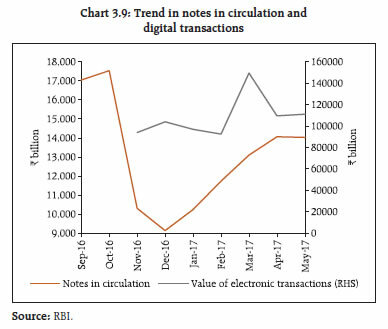 While the period of observation is not sufficiently long to derive definitive conclusions, normalisation of notes in circulation (NIC) appears to be dampening the growth of digital transactions26 (Charts 3.9 & 3.10). However, as notes in circulation (NIC) become normal again, the Government continues with the efforts to encourage digital transactions so that the push received for digital transactions in the recent past shall sustain. The traditional Debit/Credit cards and Prepaid Instruments still significantly dominate the retail payment platforms, both in value and volume. 3.33 Application of technology solutions in financial markets brings with it various opportunities to improve the functioning of financial markets, inter alia, by enhancing overall market process efficiency, by strengthening market supervision with the help of real-time surveillance of transactions and by adding to the overall transparency in the market. Financial technologies, however, also pose certain challenges which needs to be effectively dealt with. 3.34 The previous issues of FSR had flagged the emerging area of FinTech27 and RegTech28. With increasing relevance of these, regulators continue to develop their expertise. Against this backdrop, the FSDC Sub Committee, had setup a Working Group to look into various aspects of FinTech. The Working Group had submitted its report in February 2017 with key recommendations, which are being examined. 3.35 Latest developments in FinTech continue to pose challenges to regulators as well as traditional business models. In India, while the early initiatives were taken by some unregulated entities in the areas of Peer-to-Peer (P2P) lending and crowd funding, recent use of FinTech in trade credit instruments by a few private sector banks is a good start by regulated entities. On the other hand, FinTech in securities markets pose some challenges such as technological disruption arising out of products and services offered by unregulated entities; transactions outside the regulated exchange/ clearing corporation/depositories system; regulatory arbitrage; risks from outsourcing of technological products, platforms and services; customer service, customer protection, data protection and confidentiality issues; and know your customer /anti-money laundering (KYC/AML) issues. In January 2017, Institute for Development and Research in Banking Technology (IDRBT) published a white paper29 on blockchain technology (BCT), which, inter-alia, gives a prospective roadmap for the adoption of BCT to banking and finance in India. 3.36 One of the emerging risk to the financial sector is increasing trends in frauds in commercial banks and financial institutions. During the last five financial years, frauds have increased substantially both in volume and value terms. During this period, while the volume of frauds30 has increased by 19.6 per cent from 4235 to 5064, the value (loss incurred) has increased by 72 per cent from ₹97.5 billion to ₹167.7 billion. Share of frauds in advances portfolio continued to be high at 86 per cent of the frauds reported during 2016-17 (in terms of amount involved). While the fall out of adverse market conditions, recessionary trends, industry specific vulnerabilities and macro-economic risks on bank lending can be considered as relatively difficult to control and mitigate by banks, the same cannot be true in case of loan frauds. In a number of large value frauds, serious gaps in credit underwriting standards were evident. Some of the often seen gaps are liberal cash flow projection at the proposal stage, lack of continuous monitoring of cash flows and cash profits (EBITDA), lack of security perfection and over valuation, gold plating of projects, diversion of funds, double financing and general credit governance issues in banks. Moreover, almost all corporate loan related fraud cases get seasoned for 2 to 3 years as NPAs before they are reported as fraud. 3.37 Cyber frauds and security vulnerabilities (Box 3.3) have financial stability implications. Market disruption on account of cyber frauds not only bring reputational risk to banks but tags along many other risks such as business disruption risk, capacity/ resource constraint risk, financial risk and sometimes even liquidity risk. Recent incidents of risks of an interconnected technology ecosystem exemplified the dictum that the ‘strength of the chain lies in its weakest link’. Incidentally, regulation is playing a big role in companies managing cyber risk pro-actively. In UK a Parliamentary report released in February called for a “National Cyber Security Strategy”. In European Union (EU) “General Data Protection Regulation” comes into effect next year, which steeply increases fines (up to 4 per cent of their turnover) for companies judged to be careless in customer data handling. The increasing confluence of demographic change and technological breakthroughs are forcing banks to adopt delivery channels such as ATMs, internet and mobile banking, which are transforming them into faceless entities. The recent push for digitisation of financial transactions has led to growth in use of digital products, particularly the wallets and Unified Payments Interface (UPI). In April 2017, Government of India announced rolling out of Bharat Interface for Money (BHIM) app across the country and exhorted people at large to adopt digital ways of payments and receipts. Migration to digital payments bodes well for the country both in terms of cutting the cost of printing currencies as well as leaving trail of all such transactions leading to better tax compliance, but it also opens new risk frontiers as digital payment channels are introduced to people with varying economic background and literacy levels. Not only simple attacks using phishing, vishing and social engineering, but also increasingly audacious attacks by organised gangs with or without backing by State players have come to light. In such a scenario, no system can be considered safe unless the entire ecosystem is secure, which is very challenging to ensure. Two aspects need to be appreciated in this context. One, technology has reached a section of population which is not yet fully geared to adopt technology in a risk-aware manner. Two, the vendor risk faced by the banks have become more complex with multiple levels of outsourcing, leading to sophisticated technical support being ultimately provided by lowly paid and often unskilled manpower. These need to be addressed quickly by spreading awareness on the risks and ensuring that technical services are provided only by technically skilled resources. A cyber security incident could threaten financial stability through three channels: Incidents can (i) disrupt the operations of a financial firm that provides critical services, (ii) reduce confidence in firms and markets, and (iii) damage the integrity of key data31. Recent incidents such as, misuse/compromise of number of cards by launching ingenious attacks on an ATM infrastructure, remote cyber-attack on a bank from an overseas vendor location and attack on a cross border fund transfer system (albeit no loss was incurred due to timely alert) pose serious concerns on the potential impact of such attacks on financial stability, if left unmitigated. Recognising the rapidly increasing threat posed by cyber risks, in October 2016, G7 has come up with a set of Fundamental Elements of Cyber Security for the Financial Sector with stress on coordinated action among institutions, agencies and jurisdictions32. In its Guidance on Cyber Resilience for Financial Market Infrastructures (FMIs) released in June 2016, CPMI-BIS/ IOSCO states that FMIs can be sources of financial shocks, such as liquidity dislocations and credit losses, if not properly managed33. The Guidance outlines broad risk management categories and overarching components that need addressing across a FMI’s mutually enforcing cyber resilience framework. Closer home, various financial sector regulators such as the Reserve Bank, SEBI and IRDA have recently come out with stringent cyber security norms for their regulated entities. As noted earlier, collective vigil is needed for effective action. In this context, the Finance Minister, in his Budget Speech 2017-18, had stated that “Cyber security is critical for safeguarding the integrity and stability of our financial sector and announced that a Computer Emergency Response Team for Financial Sector (CERT-Fin) will be established which will work in close coordination with all financial sector regulators and other stakeholders”. Pursuant to the above announcement, a Working Group was set up with Director General, Indian Computer Emergency Response Team (CERT-In) as Chairperson on 6th March 2017, and Department of Economic Affairs, Department of Financial Services, Ministry of Electronics and Information Technology, Reserve Bank of India, Securities and Exchange Board of India, Insurance Regulatory and Development Authority of India, Pension Fund Regulatory and Development Authority of India, Institute for Development & Research in Banking Technology, Reserve Bank Information Technology Pvt Ltd and National Payment Corporation of India as members, to study and recommend measures for setting up of computer emergency response system in the financial sector. The Working Group has since submitted its report. 3.38 The Reserve Bank has performed comprehensive IT Examination of the major banks to assess their cyber risk resilience and response. Going forward, it is proposed to adopt risk-based approach by focusing on critical functions/channels and offsite assessment of key risk indicators in cyber security in banks. Incident reporting by banks, introduced in June 2016, has stabilised. An Inter-disciplinary Standing Committee has been constituted to, inter alia, review the threats inherent in the existing/emerging technology; study the adoption of various security standards/protocols; interface with stakeholders; and suggest appropriate policy interventions to strengthen cyber security and resilience. The sub groups have been set up under the Standing Committee to look into security aspects pertaining to card based payments, mobile banking and vendor risk management. 3.39 Cyber security breaches were reported not only by banks, but also by certain financial market entities. As a proactive stance, advisories were issued by SEBI to Market Infrastructural Institutions (MIIs) viz. Stock Exchanges, Clearing Corporation and Depositories to further strengthen their vigil and surveillance of their critical IT assets including website and network traffic, monitor internal network communications closely, enact a mechanism to detect and/or block behavioural anomalies on systems, servers and endpoint devices. It may be mentioned that SEBI in July 2015 has already laid down a detailed framework with regard to cyber security and cyber resilience for MIIs. With a view to further strengthening the framework, SEBI is institutionalising a three-tier structure in securities market to monitor cyber security related events and take actions as necessary in the interest of the securities market. The issues of having a holistic and robust framework for tackling cyber security related issues in Indian financial markets is also under active deliberations of the Financial Stability and Development Council (FSDC). 3.40 IRDAI has come out with a draft comprehensive information and cyber security framework for Insurance sector for designing a suitable information & cyber security policy by the regulated entities, establishing of appropriate governance structure for implementation of information & cyber security policy and audit mechanism. They have invited comments from the stakeholders before finalising the framework. 3.41 The Reserve Bank has further tightened its supervision framework by the review of prompt corrective action (PCA) framework for banks. While capital, asset quality and profitability continue to be the key areas for monitoring in the revised framework, leverage would be monitored additionally as part of the PCA framework. The corrective actions, inter-alia, include restrictions on dividend distribution/ remittance of profits, branch expansion, management compensation and directors’ fees, as applicable. Apart from regulation and surveillance, enforcement forms the third important facet of financial sector oversight mechanism. While, there is a clear demarcation of the regulatory and surveillance functions in the Reserve Bank, a need was felt to develop a sound framework and process for enforcement action. Accordingly, a separate Enforcement Department was established which started functioning from April 1, 2017. 3.42 As a part of enforcement measure, during the period January – May, 2017, RBI cancelled the licenses of 33 NBFCs. During the Financial Year 2016-17, licenses of 5 weak urban co-operative banks (UCBs) were cancelled due to precarious financial position/ major financial irregularities and lack of prospects for revival or resolution through merger with a stronger UCB or conversion into society. Further, 5 urban co-operative banks (including 2 weak banks) were merged with financially strong co-operative banks and 2 were converted into co-operative societies. Due to improvement in the financial position, directions were lifted in case of 4 UCBs. Further, based on precarious and deteriorating financial position/ persisting serious financial irregularities and absence of corrective action/progress, directions were imposed on 11 UCBs during the same period. In addition, RBI penalised 14 co-operative banks, 2 scheduled commercial banks and 2 NBFCs for non-adherence to its guidelines during the same period. The major non-compliance were in the areas of know your customer (KYC) and anti-money laundering (AML) guidelines. 3.43 Notwithstanding the above frameworks, concerns remain over the possibility of regulated entities indulging in business practices or activities which seem to be routine banking business or corporate social responsibility acts, but actually are in non-conformance with regulatory and statutory prescriptions. 3.44 With a view to pre-empting the misuse of the trading platform of the stock exchanges and check the abnormal rises in the prices of the scrips, SEBI has put in place the graded surveillance measures (GSMs). The GSMs cover two phases, viz., (i) shortlisting of the companies with surveillance-related concerns, based on the pre-defined objective criteria, and, (ii) the operationalisation of the framework of the GSMs, which include restrictions such as placing / continuing the securities in the trade for trade (TfT) category, once-in–a-week trading, once-in-a-month trading, imposing additional surveillance deposit, etc., as may be required upon breaching the prescribed threshold. 3.45 Investor grievance redressal mechanism at the market infrastructure institutions (MIIs): SEBI has reviewed its existing framework on dispute resolution and investor protection, under which Stock Exchanges (SEs) follow three tier mechanism for redressal of complaints received, viz., Investor Grievance Redressal Panel (IGRP), Arbitration and Appellate Arbitration. Under the revised arbitration mechanism of stock exchanges, there will be separate panels for arbitration and appellate arbitration. Further, for appellate arbitration, at least one member of the panel should be a retired judge. In order to safeguard the interest of the parties involved in arbitration and to ensure speedy implementation of the arbitration award, the rate of interest on the award passed by arbitrators will be in compliance with Arbitration and Conciliation (Amendment) Act, 2015. Further, on SEBI’s advice, both the national level stock exchanges have expanded the number of investors’ service centres from 14 to 24 during 2016-17, which will make arbitration mechanism of stock exchanges more accessible to investors. 3.46 Protection of clients’ assets with brokers: With a view to re-examining the current regulatory and supervisory mechanisms for protection of clients’ assets with brokers, SEBI constituted a committee in April 2015. Based on the recommendations of the committee, SEBI has strengthened the supervisory framework for brokers with effect from April 1, 2017. The new measures, inter alia, includes monitoring of clients’ funds lying with the stock broker by the stock exchanges, through a sophisticated alerting and reconciliation mechanism, uploading client’s funds and securities balances by stock brokers to stock exchange system and onward transmission of the same to the clients for better transparency; and monitoring of financial strength of stock brokers. This will serve as an early warning system to take pre-emptive and remedial measures. 3.47 Pension funds: In order to receive, consider and facilitate resolution of complaints or grievances which fall within the ambit of the regulations, the PFRDA appointed a Stipendiary Ombudsman with the powers and functions to (i) receive complaints as specified in these regulations against any intermediary or entity and to consider such complaints and facilitate resolution thereof by amicable settlement; (ii) approve a friendly or amicable settlement of the dispute between the parties; and (iii) adjudicate such complaints in the event of failure of settlement thereof in a friendly or amicable manner. 3 Stage 1 – Performing loans: when loans first come onto balance sheets, banks must recognise the 12-month expected credit loss for these loans. This is the probability in the next 12-months of a loan defaulting (PD), multiplied by the amount which a bank would lose on the default. 4 Stage 2 – Underperforming loans: where a loan begins to show a significant increase in credit risk, banks will have to make provision for the lifetime expected credit loss (ie., based on the lifetime, not the 12-month PD). 5 A financial asset shall be measured at fair value through other comprehensive income (FVOCI) if (a) the financial asset is held within a business model whose objective is achieved by both collecting contractual cash flows and selling financial assets and (b) the contractual terms of the financial asset give rise on specified dates to cash flows that are solely payments of principal and interest on the principal amount outstanding. 6 While sale from HTM portfolio results in tainting of the whole portfolio (IAS 39) in some jurisdictions, it is totally unrestricted in some other jurisdictions. The Reserve Bank follows a middle path by allowing such sales subject to disclosure above a cut-off and transfer of profit from such sales, net of taxes, to the Capital Reserve. 7 A financial asset shall be measured at amortised cost if (a) the financial asset is held within a business model whose objective is to hold financial assets in order to collect contractual cash flows and (b) the contractual terms of the financial asset give rise on specified dates to cash flows that are solely payments of principal and interest on the principal amount outstanding. 8 Common equity tier 1. 10 Monitoring results are based on data provided for a total of 210 banks, comprising 100 “Group 1 banks” (large internationally active banks that have Tier 1 capital of more than €3 billion, and include all 30 G-SIBs) and 110 “Group 2 banks” (banks that have Tier 1 capital of less than €3 billion or are not internationally active). 11 “Have Big Banks Gotten Safer?” Natasha Sarin and Lawrence H. Summers – September 2016. 18 An Internet Bot, also known as web robot, www robot or simply bot, is a software application that runs automated tasks (scripts) over the Internet. 21 Financial Sector Assessment Programme (FSAP) is a quinquennial exercise jointly conducted by IMF and World Bank in selected jurisdictions, to assess their financial stability and financial sector development. The first FSAP exercise was done for India in 2012-13 and the second one is underway in 2017. 22 The figures correspond to the transactions on stock exchanges by MFs, not the resource mobilisation by MFs. 23 B-15 are cities beyond top 15 (T-15) cities of the country. 24 Equity AUM grew by 241 per cent and non-equity AUM grew by 221 per cent. 26 March 2017 is an anomaly owing to substantial rise in RTGS/NEFT/IMPS payments due to tax payables. 27 “FinTech” can be broadly defined as technologically enabled financial innovation that could result in new business models, applications, processes or products with an associated material effect on financial markets, financial institutions and the provision of financial services (Carney (2017)). 28 Reg Tech can be seen as a part of the universe of FinTech, referring to the ‘technologies that may facilitate the delivery of regulatory requirements more efficiently and effectively than existing capabilities (Financial Conduct Authority (FCA), UK). 30 Above the cut-off of ₹100,000.